Oneita was standing in her kitchen when she got the call from ICE. I will never forget when ICE told me that my husband and I were going to be deported. My heart was racing – all I could think about was my family being torn apart, and that we would be killed if we went back to Jamaica. The whole world was on my shoulders, and I called New Sanctuary Movement. When they picked up and told me to come in, I felt a huge relief – an opening. They were there when we needed them the most. Three days later we moved into Sanctuary. When ICE closed the door on Oneita, Clive and their kids, the community at NSM fought to create an opening. ICE had also ordered the deportation of Suyapa at the same time, separating her from her four kids. NSM members came together and decided it was not a question of yes or no, but how. And we found a way to offer both families Sanctuary. We are now working with all three families in Sanctuary – Oneita and Clive, Suyapa, and Carmela – to stop their deportation and challenge unjust laws. These three families represent millions across the country. Every week, we sit with people in their homes who have had a loved one arrested – their hearts broken and family torn apart. This is the reality of the policies of the Trump Administration as it systematically works to implement an extremist ideology that wants to close all doors to this country and close in on immigrants of color. Here in Philadelphia, we have the most aggressive ICE office in the country, and they won’t stop until they close every door. As we stand in this pain, we remember the stories from our faith traditions and move from the deep belief that the divine is active, that loves always has the last word. With bold love and collective action, we fight every day to create openings – we open our congregations, our hearts, and the doors of this country. We confront codified hate and racism as we build community, and we have found abundance, family and impact. After ten years of organizing, Philadelphia ended ICE’s access to the local police database, cutting off another way ICE reaches into our communities. 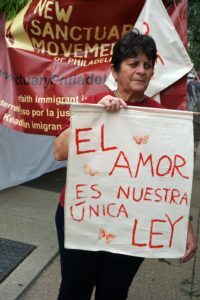 Fourteen people living in Sanctuary in Philadelphia keeps three families together, and is a powerful message to Trump that love is stronger than all the agents of ICE. The slow work of building a diverse community of people standing side by side has opened the power of building bridges and collective love. Accompanying families to court makes sure they are not alone and judges are held accountable. With bonds usually set at $10-15,000, if we are in the court, they are set at $3-7,000. Building leadership with everything we do moves us toward the long-term goal of changing the balance of power. The Trump Administration is relentless, but together we have found the power to open new possibilities, new strategies and victory. We only do this together. Will you be part of our community and make a gift today? Thank you!